How often do I change these codes? What Primary Residence Codes are available? This article targets Step 2: Homeless Students. If you are looking for the Student Programs portion of this article, you can click here. Children and youth awaiting foster care placement or living in transitional housing are categorized as living in shelters. Children and youth (including runaway or unaccompanied youth) who live with relatives or friends, due to being homeless, are categorized as doubled-up/tripled-up. Children or youth who live in abandoned buildings, campgrounds, vehicles, trailer parks, FEMA trailers, bus and train stations, and abandoned in the hospital are categorized as unsheltered. “Unsheltered” is also defined as substandard or inadequate housing and is judged on a case-by-case basis. A rule of thumb would be to see the dwelling as comparable to an automobile, in that it shelters, yet it is not adequate housing. 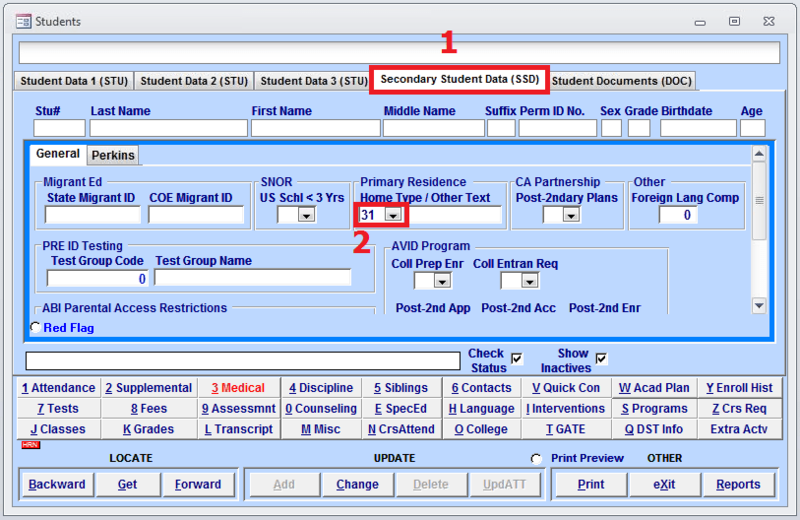 In Aeries CS, this field is considered part of the Student Information data set and is called Primary Residence. Therefore, you can update this information by navigating to a students record and clicking through to the “Secondary Student Data” Tab. Once a student changes to a Non-Permanent Housing code, leave the code frozen until the end of the year even if they move back to Permanent Housing. Changing the code back to Permanent Housing may cause an understatement of actual Homeless Students for the year. Aeries CS does not keep historical records of Primary Residence Status so a paper record is necessary for 2013-2014 but will be made obselete in 2014-2015 as part of the improvements that CALPADS will undergo in the summer. The primary residence of an individual cannot be determined. For example, the information is unavailable or was erroneously reported and is indecipherable. A type of fixed and regular residence that is owned, rented, or sublet. A temporary residence provided for homeless individuals who would otherwise sleep on the street or a temporary residence provided to individuals in emergency situations. This is also applicable to children who are in temporary residences awaiting permanent placement in foster care. A temporary residence for homeless individuals usually requiring payment or vouchers for lodging and services on a daily, weekly, or monthly basis. A temporary residence where a homeless family is sharing the housing of other persons due to the loss of housing, economic hardship, or other similar reasons. A type of residence for homeless individuals that is not meant for human habitation, such as cars, parks, sidewalks, abandoned buildings, campgrounds, trailer parks, bus and train stations, or persons abandoned in the hospital (on the street). A rule of thumb would be to see the dwelling as comparable to an automobile in that it shelters but is not adequate housing. A family residence that is licensed by the state, or other public agency having delegated authority by contract with the state to license, to provide 24-hour non-medical care and supervision for not more than six foster children, including, but not limited to, individuals with exceptional needs. This also includes Small Family Homes as described in Health and Safety Code Section 1502(c)(6) (Education Code Section 56155.5[b]), or an Approved Home of a relative. An Approved Home means the home of a relative or nonrelative extended family member that is exempt from licensure and is approved as meeting the same standards as those set forth in CCR Title 22, Div. 6, Article 3. This is not the same as a Licensed Children’s Home. A residential facility that is licensed by the state, or other public agency having delegated authority by contract with the state to license, to provide non-medical care to children, including, but not limited to, individuals with exceptional needs. Licensed children’s institution includes a group home as defined by subdivision (g) of Section 80001 of Title 22 of the California Code of Regulations. As used in this article and Article 3 (commencing with Section 56836.16) of Chapter 7.2, a licensed children’s institution does not include any of the following: (1) A juvenile court school, juvenile hall, juvenile home, day center, juvenile ranch, or juvenile camp administered pursuant to Article 2.5 (commencing with Section 48645) of Chapter 4 of Part 27. (2) A county community school program provided pursuant to Section 1981. (3) Any special education programs provided pursuant to Section 56150. (4) Any other public agency. A nonsectarian school where a student with exceptional needs resides on a 24-hour basis and receives special education and related services at the school. This includes both public and private facilities. This is not the same as an Incarceration Institution or a Licensed ChildrenÆs Institution. A public hospital, state licensed children’s hospital, psychiatric hospital, proprietary hospital, or a health facility for medical purposes. (E.C. 56167(a)). It does not include state hospitals operated by the California Department of Developmental Services. Individuals who have been adjudicated by the juvenile court, for placement in a juvenile hall or juvenile home, day center, ranch, or camp, or for individuals placed in a county community school (E.C. 56150); includes placement in the Department of Corrections – Division of Juvenile Justice (formerly California Education Authority or California Youth Authority), and other public correctional institutions. A residential facility providing services to individuals who have been determined by the Department of Developmental Services (DDS) regional centers to require programs, training, care, treatment and supervision in a structured health facility setting on a 24-hour basis. This is not the same as Residential School/Dormitory, Health Institution, or State Hospital. A state hospital is a residential facility operated by the California Department of Mental Health (DMH). This is not the same as Residential School/Dormitory, Health Institution, or Development Center. Any other type of residence not referenced in any other Primary Residence Category.